Description: Baalboden has been ravaged. The brutal Commander's whereabouts are unknown. And Rachel, grief stricken over her father's death, needs Logan more than ever. With their ragged group of survivors struggling to forge a future, it's up to Logan to become the leader they need—with Rachel by his side. Under constant threat from rival Carrington's army, who is after the device that controls the Cursed One, the group decides to abandon the ruins of their home and take their chances in the Wasteland. Deception is an emotional read that delves into the condition of the human spirit. Deception directly deals with the consequences and decisions made in Defiance. Both, Rachel and Logan made devastating choices and now they have to pay the price for their decisions in addition to dealing with the Commanders cruel ways. Deception in a nutshell is about tough choices, grief, loss and learning to live in the wake of devastating events. C.J Redwine concentrates on the inner struggle of the characters delivering an emotive book. Deception introduces a whole host of distressing problems for Rachel and Logan. After Baalboden burned down Logan in now in charge of the survivors. To survive Rachel, Logan and the survivors need to leave Baalboden and head north to another City State across the wasteland before the Commander and his army destroy them. However their journey is rife with danger at every turn. The Commander is not the only person that is hunting the survivors, someone else is out for justice and people are dying as a result. We only get to see glimpses of the Commander in this book as there is a new evil introduced. The villain of this book is really easy to predict but it is still a haunting betrayal. Together Logan and Rachel need to get everyone to safety, stop a killer and evade an army. Deception is an entirely different book from Defiance. The characters are not the same. They have been through hell and back and now have to deal with not only their inner conscience but with those hunting and questioning their motive. There is less action and the story is slower paced, but this allows the majority of the books attention to be about the characters. In some books, the characters are not given enough time to deal with their grief/pain/suffering because If they did they wouldn’t be able to function and sit in a corner rocking all day. 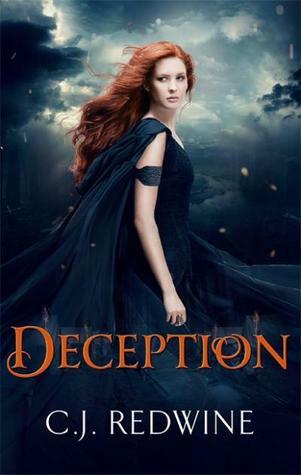 It wouldn’t necessarily make for a good story, but in Deception the inner struggles of the characters makes the story more compelling and realistic given the events. Redwine allows these characters to slowly unwind and deal with all of the pain and suffering that has been dealt to them. She takes these characters to very dark places before she builds them back up. It makes your heart break, especially for Rachel. The book discusses the human condition and how to still be the person you are despite everything. How do you find yourself? There were a few moments that the characters inner struggles were overdone a bit, but ultimately these characters make up the heart of this story. Rachel is also a force to be reckoned with. She is fierce, brave, loyal and unyielding, yet she is a mess on the inside. She carries the grief of killing Melkin, and the loss of losing her Dad and Oliver. She refuses to let herself feel anything and as a result she breaks down despite the strong front she puts up. Her vengeance against the commander drives her. Rachel learns valuable lessons about herself, and by the end she is ready to put her self back together slowly. We learn more about Logan in this book. His past comes to light, but his intelligence and compassion truly shine in this book. He’s been given the burden of leading people and it’s not a burden he carries lightly. He genuinely cares about them. I love Logan and Rachel together. Their relationship is full of understanding and support tied together with a fierce love. They both know that there is something wrong with the other and they support each other to the fullest. They are always there for each other. We meet quite a few new characters amongst the remaining survivors. Quinn also has a solid presence. He helps Logan and especially Rachel in every way he can. He’s like Rachel’s guardian angel. Willow is my favourite character. Blunt and to the point, she’s a force to be reckoned with. She has some of the funniest lines in this book. Rachel, Logan, Quinn and Willow together make a formidable team. Deception is a great read, with plenty of murder and mayhem to go around. The ending is explosive and I can’t wait for the next book.